A bespoke design will mean that every aspect of the kitchen is made to your exact tastes, measurements, and user ability. You will not have to lose out on looks, and you can have a fully functional space made for just the disabled user, or one that is multifunctional for both the disabled and ambulatory alike. Many fear that such quality will come at a high price, but it is possible to get great design at low cost. Ultimately, the key to a successful wheelchair friendly kitchen is one that incorporates the basic principles of kitchen design, combined with an understanding of the user's needs and abilities. 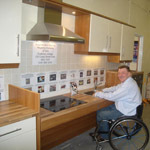 If the wheelchair user lives alone, the kitchen design can be solely dedicated to meeting their requirements. If they live with an able bodied person, the design will have to work equally well for each of them. Click Here to check prices online for your Kitchen.